Abdominal aortic aneurysm (AAA) characterized by dilation of the abdominal aorta is one of the top 10 causes of death among older men1. Although the cause of AAA remains unknown in the majority of cases, several key regulators of AAA pathogenesis are known. AAA is known to develop mainly by the increased diameter of aorta through metalloproteinases (MMPs). MMPs have been shown to play a major role in progressive extracellular matrix (ECM) degradation in AAA2,3. The activation of MMPs is tightly regulated under physiologic conditions by the tissue inhibitors of metalloproteinases (TIMPs) which comprise a family of 4 protease inhibitors: TIMP-1, TIMP-2, TIMP-3, and TIMP-44. An imbalance between MMPs and TIMPs may serve to fragility of arterial wall and may contribute to the degenerative process of AAA formation, however, little is known about TIMPs/MMP behavior in aneurysmal formation5. Some studies have demonstrated that the regulated TIMPs suppress medial degradation and aneurysm formation. The mRNA levels of TIMPs were decreased in AAA tissue6,7. In general, the TIMPs have no specificity for any MMP in particular, although TIMP-1 has a higher affinity for MMP-9 and TIMP-2 for MMP-28,9. Interestingly, in a recent study was demonstrated that TIMP-3 attenuate migration and proliferation, and apoptosis and inhibited the activity of MMP-2, MMP-9 and TNF-α secretion. This inhibition of MMP-2 and MMP-9 activity may prevent excessive degeneration of the ECM, and therefore the resulting dilation of the aortic wall10. Therefore, science is gradually unraveling the TIMPs role in the development/suppression of aneurysms, however more studies are needed to elucidate this process. The balance between production of MMPs and TIMPs is a major extent to maintain homeostasis of extracellular matrix. When there is any imbalance or excess MMP activity in the tissues can be the installation of a pathological process in the extracellular matrix11. For this reason, there is great interest in developing synthetic inhibitors of MMPs that can be used in medical therapies12,13. Besides that, due to the risks associated with aortic surgery and AAA repair, several recent investigations have focused on using pharmacologic means to slow aneurysmal growth and postpone or lessen the need for surgical repair of large AAAs14. Because of their potential in therapeutic approaches, MMP inhibitors (natural and synthetic) have been tested in experimental models of vascular human diseases15-17. Doxycycline, a member of the tetracycline antibiotic family, has been shown in inhibit MMP-2 and MMP-9 expression and activity as well as AAA growth in several studies utilizing AAA animal models18-20. Further, doxycycline has been used to prevent AAA formation in animals through the inhibition of MMP expression and study in humans reported an increase in TIMPs levels21,22. Currently, doxycycline is considered the lead candidate for pharmaceutical stabilization of AAAs. However, some studies provide conflicting evidence. While several studies of doxycycline provide significant evidence of a beneficial effect for AAA, such as limitation of AAA growth, limitation of ECM remodeling and inflammation and has particularly been suggested to reduce MMP activity in pilot human trials and in rodent studies23,24, one study showed any effects of doxycycline in treatment of AAA patients25. An additional trial is underway in the United States examining the efficacy of a higher dose of doxycycline in a sample of 248 patients26. Based on the present state of knowledge, the authors agree with the hypothesis that inflammation results in AAA growth and elevates MMP-9 and high sensitivity C reactive protein (hs-CRP) levels as markers of this inflammation. Their hypotheses, doxycycline will produce a series of events: 1) therapeutic levels of doxycycline are achieved in the aneurysm; 2) reduction of MMP-9 levels; 3) reduction in hs-CRP; 4) reduction in aneurysm expansion. According the authors this sequence of events takes time to change the course of aneurysm growth. No effect may be seen at early time points while doxycycline may prove effective in the longer term. Consequently, they designed the primary end point of this trial to be measured after 24 months26. The doxycycline as a pharmacological strategy for the management of Thoracic aortic aneurysm (TAA) is considered to be of great potential. TAA are rare but potentially devastating condition with etiopathology multifactorial and still not well-defined but can be caused by genetic factors and can be involved in Marfan Syndrome27. Several studies suggest that TAA the chronic inflammatory process and remodeling may be related to changes in balance between MMP/TIMP and this mechanism is similar to AAA28. Doxycycline through its inhibitory effects on MMP-2 and MMP-9, acts on vessels and preserves aortic mechanical properties, integrity of elastic fibers, endothelium-dependent relaxation and SMC (smooth muscle cells) contractile function29,30. In previous studies performed in our laboratory, was created a new model of AAA induction by combining two potential causes of MMP secretion: acute inflammation and turbulent blood flow31. In isolation, these causes were insufficient to provoke arterial dilatation and aneurysms but when combined, the abundant MMP-2 and MMP-9 secretion and activation promoted elastin degradation, wall remodeling and aneurysm formation in approximately 65% of the animals. The technique of the new model was efficient, causing the development of extraordinarily dilated aneurysms with the morphology similar to that of human abdominal aneurysms only in 3 days. Data already published shows that initial inflammation is clearly acute and potent and seems to be autoregulated. After the seventh days post-surgery, the aneurysms maintained practically the same diameter, but the wall aneurysm changed completely to show a predominantly progressive remodeling process, characterized by mononuclear inflammatory cells intermixed in a remarkable intercellular matrix showing myofibroblastic proliferation, vascular neoformation, and collagen deposition. In contrast to the MMP-9 behavior, which shows a tendency to diminish after the initial peak, MMP-2 expression shows a progressive augmentation suitable for synergistic action in the wall remodeling process. Therefore, our hypothesis is that potent initial inflammatory stimuli lead to arterial wall weakness and dilation, which is maintained in the second step by the altered regulation of the endothelial cells submitted to turbulent flow in the post-stenotic area31-33. However, the detailed mechanism of chronic inflammation in this experimental model needed to be more elucidated, but is similar to the literature. Moreover, in our previous study already published, was administrated doxycycline 48 hours before surgical induction of AAA. 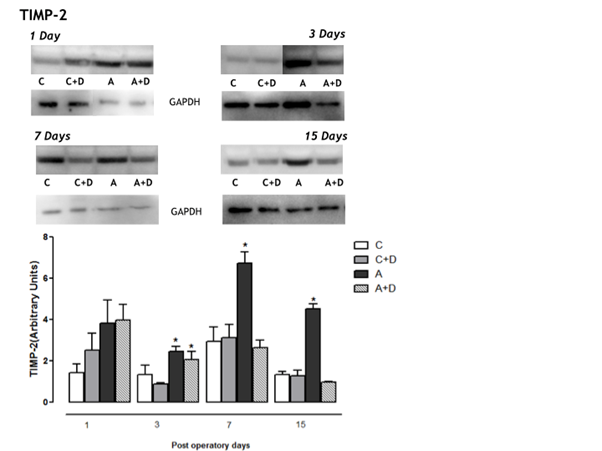 In this study was observed the inhibition of formation and development of AAA, reduction of the inflammatory response and gelatinolytic activity of MMP-2 and MMP-9 in the aortic wall and, consequently, limited AAA formation in 85% of rats in this AAA model31. In addition to the previous results already published, in this commentary we have complementary results regarding our paper “Interference of doxycycline pretreatment in a model of abdominal aortic aneurysms"32. Here we have included new findings of the TIMPs 1 and 2 expressions in animals submitted to AAA surgical induction associated with doxycycline pretreatment. The surgical procedure was previously described32. The doxycycline administration was started 48 hours before the surgical induction of AAA, following until the end of the experiment [1, 3, 7, and 15 days post-surgery (dps)]. Through the western blot analyses was measurement the expression of TIMPs 1 and 2. The entire protocol of harvesting, measuring the morphometric analysis of aorta and the western blot were performed as previously described31-33. Here, the results show the overexpression of TIMPs 1 and 2 in aneurysms groups (A), followed the increase of MMP-9 and MMP-2 levels in animals with aneurysm formation32, and demonstrated that the pretreatment with doxycycline [Aneurysms+Doxycycline (A+D)] provide a great down-regulation of TIMPs 1 and 2 expressions (figures 1 and 2). According to some authors, the overexpression of TIMP prevent the depletion of elastin and the aneurysm rupture in an experimental model of AAA induction, probably by inhibiting destruction of the wall, blocking the MMP-2 and MMP-934. In our results was detected an increase of TIMPs 1 and 2 expression in the aneurysms (A group), probably in an attempt to counteract the increased activity of MMPs 2 and 9. However, their increased weren’t enough to inhibit the action of MMPs 2 and 9, because there was an increased of inflammatory cells, elastic fibers destruction and consequently development of AAA32. In the groups treated with doxycycline (A+D) the expressions of TIMP 1 and 2 remained close to baseline levels from the third day, similar to expression found in the control groups (C and C+D). These data indicate an imbalance between MMP-2 and MMP-9 and their inhibitors and additionally the doxycycline was able to regulate the expression of TIMP-1 and TIMP-2 in abdominal aortic aneurysm progression. Figure 1: Protein amount (A) and tissue distribution of TIMP-1 expressions in aorta (B). Tissue homogenates of blood vessel were prepared for Western blots using anti-TIMP-1. Note the increase of TIMP-1 expression on the A group at 1st, 3rd and 7th post operative days compared with to C, C+D and A+D groups (P<0.05). * Means A group versus C, C+D and A+D; # Means A+D versus C and C+D. Figure 2: Protein amount (A) and tissue distribution of TIMP-2 expressions in aorta (B). 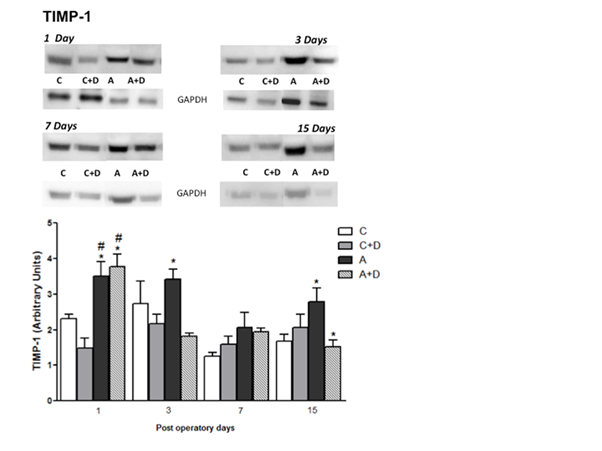 Tissue homogenates of blood vessel were prepared for Western blots using anti-TIMP-2 antibody. Note the increase of TIMP-2 expression on the A group compared to C, C+D and A+D (P<0.05) from 3rd post operative days. * Means A group versus C, C+D and A+D; # Means C+D versus C and A+D. Similar to our findings, the study conducted by Kim et al., demonstrated the upregulated expression of TIMPs and MMP-9 in the arterial wall of patients harboring cerebral aneurysms and the aneurysm wall were markedly increased beyond levels in both extracranial arteries35. However, the role of TIMPs in the initiation and progression of aneurysms still unclear. Although there is no evidence that TIMPs are involved in transcriptional regulation of MMPs, TIMPs may enhance the gene expression of MMPs by some positive feedback mechanisms36. TIMP-1 is also known to be an important modulator in the pathogenesis of AAA and is highly expressed in arterial walls of AAAs compared to the control arteries. On the other hand, TIMP-2 gene expression did not correlate with AAA, suggesting that its role is not important in the initiation and progression of AAAs37,38. Nevertheless, it is highly possible that the altered balance between MMPs and TIMPs is also one of the major causes leading to the progression and rupture of aneurysms. Generally, when the expression of MMPs is increased, the TIMPs expression is decreased. However, it is still unclear whether the increase in MMPs activity, decreased TIMPs activity or loss of balance between MMPs and TIMPs that are the main biochemical disorders that lead to degeneration of the middle layer, and subsequently the dilation of the aortic39. Furthermore, some studies demonstrate that doxycycline causes increased expression of TIMPs, but these results were found when the TIMPs expressions were decreased in aneurysmal tissue33. In conclusion we found the overexpression of TIMPs 1 and 2 following the increase of expression of MMPs 2 and 9, probably in an attempt to balance the MMP levels. Therefore, our data demonstrated that doxycycline pretreatment provide a regulation of TIMPs 1 and 2 expressions in this aneurysm model, and suggest that the balance of TIMPs have a protective effect on the progression of abdominal aortic aneurysms. Several studies demonstrated in both rat and mouse models that doxycycline suppresses formation of AAAs, by inhibition of selective blockade of elastolytic MMP expression in infiltrating inflammatory cells16,17, although in a few studies, doxycycline administration did not influence AAA progression and aortic rupture in angiotensin II-infused mice23,25. Reasons for these divergences can be because doxycycline was administered to mice with established AAAs. Although of science is gradually unraveling the TIMPs role in the development/suppression of aneurysms, there are a discrepancy in results as well as little knowledge about the role of TIMPs in the development / suppression of AAAs, and therefore further studies are needed. Thus, the inhibitory mechanisms of doxycycline in the pathogenesis of AAA were not only decrease of the gelatinolytic activity but also regulation of the expression of TIMP-1 and TIMP-2 and ameliorating the inflammation. Doxycycline could effectively inhibit the onset and progression of AAA induced by mechanic surgical model, inhibiting of expression and activity of TIMP-1, TIMP-2, MMP-2 and MMP-9 and inflammatory factors. Therefore, doxycycline may have great potential to be used in clinic for treatment of the small aneurysms. Some studies including clinical trials in which patients with small aneurysms allocated to medical treatment with the intention of retarding aneurysm expansion were treated with doxycycline and other antibiotics. These studies showed that there is potentially promising evidence for antibiotics reducing the growth rates of small aneurysms40,41. However, more research is needed to develop strategies to regulate specific MMPs and TIMPs, in a particular disease without affecting other metalloproteinases that are vital for maintaining normal physiological functions. This research was supported by Fundação de Amparo à Pesquisa do Estado de São Paulo - FAPESP (2016/21710-4). Aggarwal S, Qamar A, Sharma V, et al. Abdominal aortic aneurysm: A comprehensive review. Exp Clin Cardiol. 2011; 16(1): 11-52. Thompson RW, Geraghty PJ, Lee JK. Abdominal aortic aneurysms: basic mechanisms and clinical implications. Curr Probl Surg. 2002; Vol. 39, N.2: 110-230. Nordon I M, Hinchliffe R J, Loftus I, et al. Pathophysiology and epidemiology of abdominal aortic aneurysms. Nat Rev Cardiol. 2011; Vol. 8, N. 2: 92- 102. Abbas AK, Kumar V, Fausto N. Robbins and Cotran Pathologic Basis of Disease. 2011; 8ed. Rio de Janeiro: Elsevier. Bumdelger B, Kokubo H, Kamata R, et al. Induction of Timp1 in smooth muscle cells during development of abdominal aortic aneurysms. Hiroshima J Med Sci. 2013 Sep; 62(3): 63-7. Choke E, Cockerill G,Wilson W, et al. A review of biological factors implicated in abdominal aortic aneurysm rupture. Eur J Vasc Endovasc Surg. 2005; Vol. 30, N. 3: 227-44. Miyake T, Morishita R. Pharmacological treatment of abdominal aortic aneurysm. Cardiovasc Res. 2009; Vol. 83, N. 3: 436-43. Li DY, Brooke B, Davis EC, et al. elastin is an essenciak determinant of arterial morphogenesis. Nature. 1998; 393(6682): 276-80. Chow AK, Cena J, et al. Acute actions and novel targets of matrix metalloproteinases in the heart and vasculature. Br J Pharmacol. 2007; 152(2): 189-205. Zhai H, Qi X, Li Z, et al. TIMP-3 suppresses the proliferation and migration of SMCs from the aortic neck of atherosclerotic AAA in rabbits, via decreased MMP-2 and MMP-9 activity, and reduced TNF-α expression.Mol Med Rep. 2018 Aug; 18(2): 2061-2067. Wang X, Khalil RA. Matrix Metalloproteinases, Vascular Remodeling, and Vascular Disease. Adv Pharmacol. 2018; 81: 241-330. Souza AP, Line SRP. The biology of matrix metalloproteinases. Rev Fac Odontol Bauru. 2002; 10(1): 1-6. Wang SK, Murphy MP. Immune Modulation as a Treatment for Abdominal Aortic Aneurysms. Circ Res. 2018 Mar 30; 122(7): 925-927. Kuivaniemi H, Ryer EJ, Elmore JR, et al. Understanding the pathogenesis of abdominal aortic aneurysms. Expert Rev Cardiovasc Ther. 2015; 13(9): 975-87. Prall AK, Longo GM, Mayhan WG, et al. Doxycycline in patients with abdominal aortic aneurysms and in mice: comparison of serum levels and effect on aneurysm growth in mice. J Vasc Surg. 2002; 35: 923– 9. Bartoli MA, Parodi FE, Chu J, et al. Localized administration of doxycycline suppresses aortic dilatation in an experimental mouse model of abdominal aortic aneurysm. Ann Vasc Surg. 2006; 20: 228–36. Yu M, Chen C, Cao Y, et al. Inhibitory effects of doxycycline on the onset and progression of abdominal aortic aneurysm and its related mechanisms. Eur J Pharmacol. 2017 Sep 15; 811: 101-109. Kurosawa K, Matsumura JS, Yamanouchi D. Current status of medical treatment for abdominal aortic aneurysm. Circulation journal: official journal of the Japanese Circulation Society. 2013; 77(12): 2860–2866. Castro MM, Rizzi E, Prado CM, et al. Imbalance between matrix metalloproteinases and tissue inhibitor of metalloproteinases in hypertensive vascular remodeling. Matrix Biol. 2010 Apr; 29(3): 194-201. Abdul-Hussien H, Hanemaaijer R, Verheijen JH, et al. Doxycycline therapy for abdominal aneurysm: Improved proteolytic balance through reduced neutrophil content. J Vasc Surg. 2009; 49(3): 741-9. Lindeman JH, Abdul-Hussien H, van Bockel JH, et al. Clinical trial of doxycycline for matrix metalloproteinase-9 inhibition in patients with an abdominal aneurysm: doxycycline selectively depletes aortic wall neutrophils and cytotoxic T cells. Circulation. 2009; 119(16): 2209-16. Dodd BR, Spence RA. Doxycycline inhibition of abdominal aortic aneurysm growth: a systematic review of the literature. Curr Vasc Pharmacol. 2011; 9: 471–8. Golledge J, Norman PE. Current status of medical management for abdominal aortic aneurysm. Atherosclerosis. 2011; 217: 57-63. Meijer CA, Stijnen T, Wasser MN, et al. Doxycycline for stabilization of abdominal aortic aneurysms: a randomized trial. Ann Intern Med. 2013; 159: 815-23. Baxter BT, Matsumura J, Curci J, et al. N-TA(3)CT Investigators. Non-invasive Treatment of Abdominal Aortic Aneurysm Clinical Trial (N-TA(3)CT): Design of a Phase IIb, placebo-controlled, double-blind, randomized clinical trial of doxycycline for the reduction of growth of small abdominal aortic aneurysm. Contemp Clin Trials. 2016; 48: 91-8. Ruddy JM, Jones JA, Ikonomidis JS. Pathophysiology of thoracic aortic aneurysm (TAA): is it not one uniform aorta? Role of embryologic origin. Prog Cardiovasc Dis. 2013 Jul-Aug; 56(1): 68-73. doi: 10.1016/j.pcad.2013.04.002. Epub 2013 May 15. Review. Barbour JR, Spinale FG, Ikonomidis JS. Proteinase systems and thoracic aortic aneurysm progression. J Surg Res. 2007 May 15; 139(2): 292-307. Epub 2007 Feb 9. Review. Chung AW, Yang HH, Radomski MW, et al. Long-term doxycycline is more effective than atenolol to prevent thoracic aortic aneurysm in marfan syndrome through the inhibition of matrix metalloproteinase-2 and -9. Circ Res. 2008 Apr 25; 102(8): e73-85. Mata KM, Prudente PS, Rocha FS, et al. Combining two potential causes of metalloproteinase secretion causes abdominal aortic aneurysms in rats: a new experimental model. Int J Exp Pathol. 2011; 92(1): 26-39. Mata KM, Tefé-Silva C, Floriano EM, Fernandes CR, Rizzi E, Gerlach RF, Mazzuca MQ, Ramos SG. Interference of doxycycline pretreatment in a model of abdominal aortic aneurysms. Cardiovasc Pathol 2015; 24(2):110-20. Mata KM, Fernandes CR, Tefé-Silva C, Floriano EM, Gerlach RF, Ramos SG. Response to the "letter regarding Interference of doxycycline pretreatment in a model of abdominal aortic aneurysms". Cardiovasc Pathol 2015;24(4):262-3. Allaire E, Forough R, Clowes M, Starcher B, Clowes AW. Local overexpression of TIMP- 1 prevents aortic aneurysm degeneration and rupture in a rat model. J Clin Invest 1998; 1;102(7):1413-20. Kim SC, Singh M, Huang J, Prestigiacomo CJ, Winfree CJ, Solomon RA, Connolly ES. Matrix metalloproteinase-9 in cerebral aneurysms. Neurosurgery 1997; 41: 642– 646. Aoki T, Kataoka H, Moriwaki T, Nozaki K, Hashimoto N. Role of TIMP-1 and TIMP-2 in the progression of cerebral aneurysms. Stroke 2007 Aug; 38(8): 2337-45). Nishimura K, Ikebuchi M, Kanaoka Y, Ohgi S, Ueta E, Nanba E, Ito H. Relationships between Matrix metalloproteinases and tissue inhibitor of metalloproteinases in the wall of abdominal aortic aneurysms. Int Angiol 2003; 22: 229 –238. Higashikata T, Yamagishi M, Sasaki H, Minatoya K, Ogino H, Ishibashi-Ueda H, Hao H, Nagaya N, Tomoike H, Sakamoto A. Appli- cation of real-time RT-PCR to quantifying gene expression of matrix metalloproteinases and tissue inhibitors of metalloproteinases in human abdominal aortic aneurysm. Atherosclerosis 2004; 177: 353–360. Tsarouhas K, Soufla G, Apostolakis S, Zaravinos A, Panagiotou M, Khoury M, Hassoulas JA, Tsatsakis AM, Spandidos DA. Transcriptional regulation of TIMPs in ascending aorta aneurysms. Thromb Res. 2010; 126(5): 399-405. Rughani G, Robertson L, Clarke M. Medical treatment for small abdominal aortic aneurysms. Cochrane Database Syst Rev. 2012 Sep 12; (9): CD009536.Review. Baxter BT, Terrin MC, Dalman RL. Medical management of small abdominal aortic aneurysms. Circulation. 2008 Apr 8; 117(14): 1883-9. Review. © 2018 Mata KM. This article is distributed under the terms of the Creative Commons Attribution 4.0 International License.